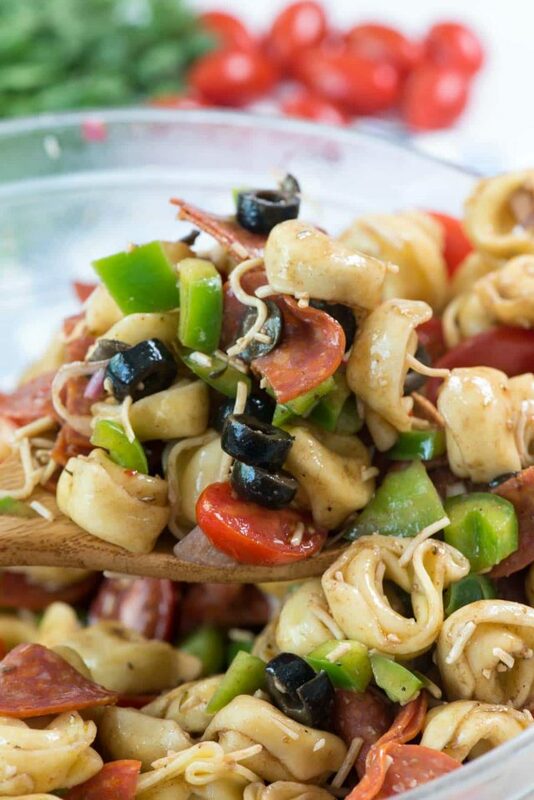 Pizza Tortellini Salad – this easy pasta salad recipe is full of pizza flavor with cheese tortellini, pepperoni, bell peppers, olives, tomatoes and a homemade balsamic dressing! 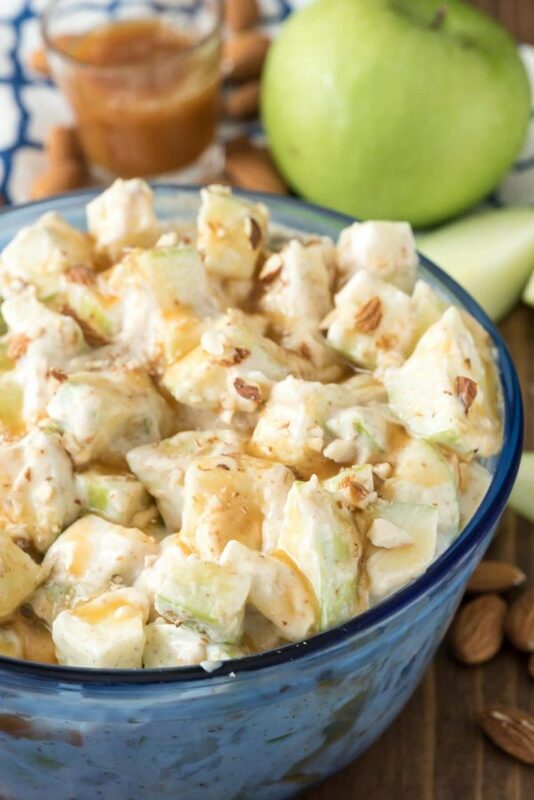 It’s perfect for a summer potluck! I loooooove pasta salad. I never liked it when I was younger because I didn’t like dressing (are you surprised?) but as an adult? I can eat an entire batch all by myself. And if it’s tortellini? Even better. Now indulge in Jocelyn’s meat lover’s pizza skillet ravioli or Holly’s one pot pizza tortellini bake when Mel is out of town for work. Then I make way too much and pretend I’m a single 20-something who doesn’t have to worry about carbs. Pasta salads are all the rage these days. I’ve seen tons of variations all over Facebook and Pinterest: taco, Greek, Italian…and so many more. I decided I just HAD to share this PIZZA Tortellini Salad because I’ve been making it for years and everyone always raves about it. 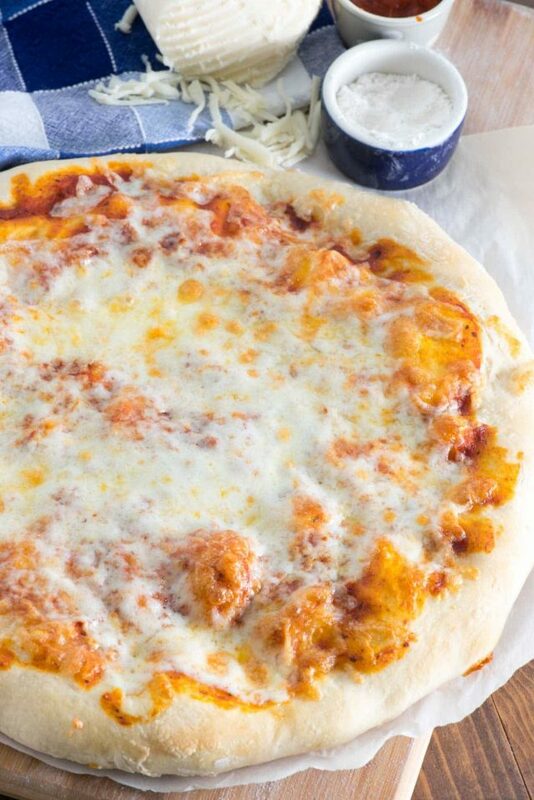 Plus, it’s pasta with pepperoni…what could be better than that? Funny story, my parents have a funny name for tortellini. Can you guess what it is? I actually can’t tell you what it is, except it starts with “little” and involves a word that someone would yell at me for if I type it. Why do they call it that? Really I have no idea. But, to this day, all I think of when I buy tortellini is that I’m buying a bunch of little ——–. BLACK OLIVES! Sorry for shouting but I love them so much. I never get to eat them either because no one I know likes them. On pizza? BEST EVER! Parmesan cheese – what pasta salad doesn’t have cheese? Not one I’m eating! Let’s talk about dressing for a minute. You can totally buy your own from the store. No need to make it from scratch but if you do? Use MY balsamic recipe. I make it all the time because it’s so good. I has shallot and garlic and herbs and….mustard. I hate mustard, yes I know. To me, mustard is the absolute devil. I will not touch it. Making my husband a sandwich makes me sick. BUT…in this dressing, it’s actually good. There’s so much balsamic and other flavors you don’t even taste the mustard (and I know, because in 99% of dressing recipes I can sure taste it if it’s there). I love adding it because it helps the recipe emulsify (as in, blend together). You don’t need a fancy whisk or anything to make the dressing either: go buy yourself a mason jar. Then add the ingredients and shake shake shake! 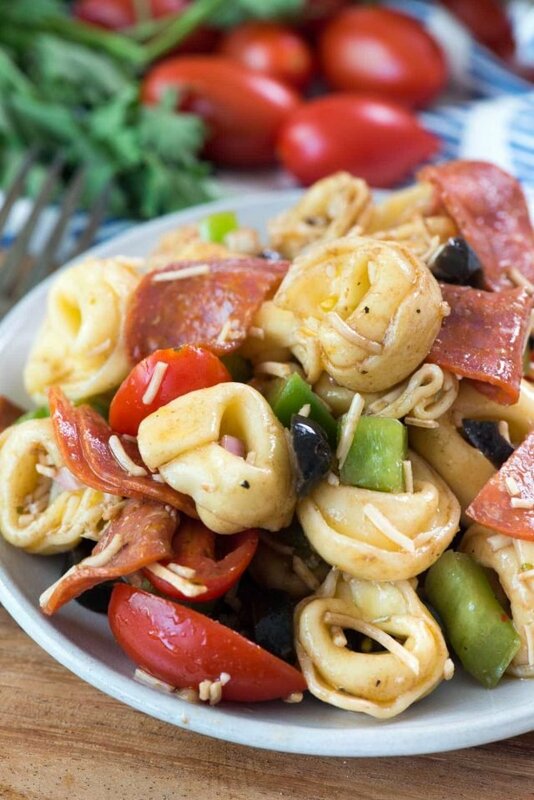 With the lightness of the dressing and the flavors of pepperoni, olive, pepper, tomato and cheesy pasta, this pizza tortellini salad tastes JUST like you’re eating a slice of pizza. It’s the perfect potluck dish and I’ll be for sure making it a TON this summer! Pizza Tortellini Salad - this easy pasta salad recipe is full of pizza flavor with cheese tortellini, pepperoni, bell peppers, olives, tomatoes and a homemade balsamic dressing! It's perfect for a summer potluck! Stir together cooked tortellini, pepper, tomatoes, pepperoni, olives, and shredded parmesan in a large serving bowl. To make dressing: add all ingredients to a mason jar or dressing container. Seal and shake well to combine. Dress the salad with desired amount of dressing. There will be dressing left over; store in refrigerator for up to 1 week. Pasta salad is good prepared for up to 2 days; store tightly covered in refrigerator. If you love pasta salad, be sure to try Taco Pasta Salad by Wine & Glue, Greek Pasta Salad by Noble Pig, or Cowboy Pasta Salad by Bellyfull. I can see how this would be a huge party/potluck/picnic kind of crowd favorite! I didn’t know you were that passionate about black olives although I did know you aren’t a mustard fan. I love hearing your food do’s and don’ts 🙂 And I didn’t know Mel was low/no carb! I’m going to try this with some caramelized onions and mozarella pearls stirred in! I’ve made this several times now and loved it, as well as the people I’ve made it for! 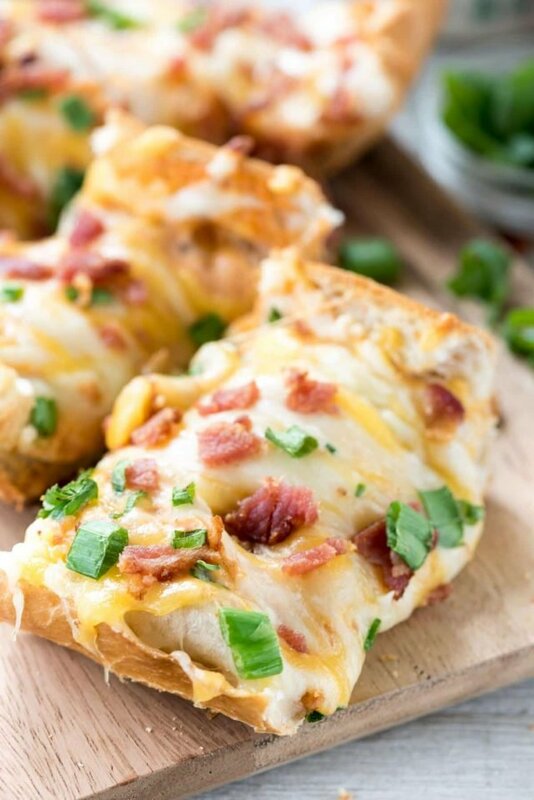 Definitely a keeper, and will be great to have on hand for potlucks since it’s not mayo based. I stuck to the recipe exactly the first time and it came out perfect. And the dressing makes way more than is needed so I keep it for salads later in the week. Second time I used grated instead of shredded parm, and it wasn’t as good so keep to grated!